As a national historic landmark, Old Faithful Inn is the most requested lodging facility in the park. 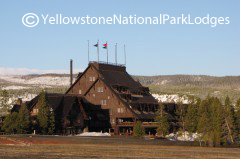 The rustic-style lodge with log and wood shingle exterior is located adjacent to the world famous Old Faithful Geyser. The original part of the Inn, known as the “Old House,” was completed in 1904 and includes an immense lobby with a huge stone fireplace. The East and West Wings were added in the teens and the twenties, with many rooms having been remodeled in recent years. Guest accommodations include rooms with private and shared baths. Additionally, a full service restaurant, deli, gift store and interpretive tours are available at the Inn.